Ensemble ,,University" has been established in 1996. Since its inception the ensemble has passed a large and successful way. The ensemble published 7 audio and three video albums. Many times it was awarded with diplomas, certificates and prizes, both in Georgia and abroad. Their repertoire is diverse - performing as a folk songs and carols, as well as pop songs. 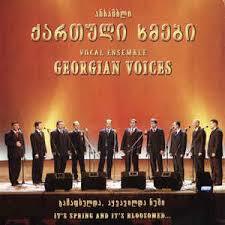 During 19 years, the ensemble ,,Georgian Voices " has held numerous concerts, as in various European and Asian countries, as well as in the various cities of the United States of America. There is a permanent demand on their invitation to abroad. Every year, under the aegis of the Ministry of Culture and Monument Protection of Georgia in different European countries are conducting the concerts, where Georgia is represented by the ensemble ,,Georgian Voices". The popularity and success of the ensemble is conditioned by the talent and personal dignity of the ensemble’s each member. Ensemble is not limited only with singing - there is a power of the ensemble members’ great friendship between each other. Their families, lots of friends and the army of audience – everything this gives them an incentive to go forward with enthusiasm and to make a great deal for the country, what is called the maintaining and promotion of Georgian songs for next generations and popularization of the Georgia abroad.